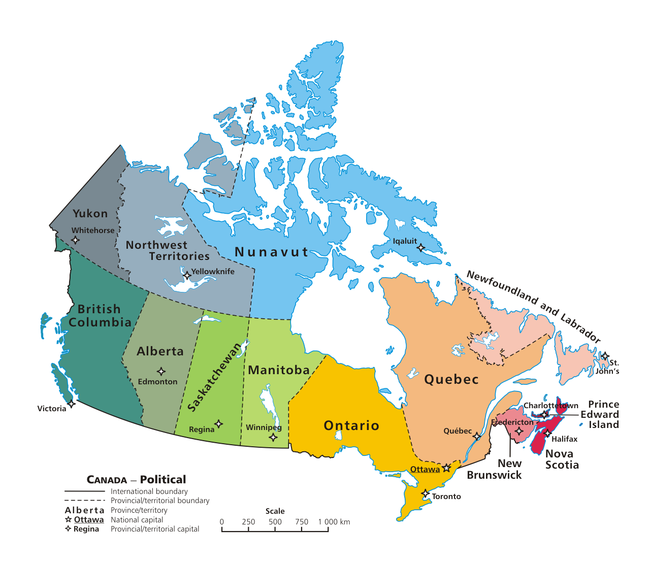 ↑ 1.0 1.1 "Provinces and Territories". Government of Canada. 2013. http://www.canada.gc.ca/othergov-autregouv/prov-eng.html. Retrieved on August 6, 2013. ↑ Place name (2013). "Census Profile". Statistic Canada. http://www12.statcan.gc.ca/census-recensement/2011/dp-pd/prof/index.cfm?Lang=E. Retrieved on August 6, 2013. ↑ 4.0 4.1 "Population and dwelling counts, for Canada, provinces and territories, 2011 and 2006 censuses". Statistic Canada. 2012. http://www12.statcan.ca/census-recensement/2011/dp-pd/hlt-fst/pd-pl/Table-Tableau.cfm?LANG=Eng&T=101&S=50&O=A. Retrieved on February 8, 2012. ↑ 5.0 5.1 5.2 5.3 5.4 5.5 "Land and freshwater area, by province and territory". Statistics Canada. 2005. http://www40.statcan.gc.ca/l01/cst01/phys01-eng.htm. Retrieved on August 4, 2013. ↑ "Official Language Policies of the Canadian Provinces". Fraser Institute. 2012. http://www.fraserinstitute.org/uploadedFiles/fraser-ca/Content/research-news/research/publications/official-language-policies-of-canadian-provinces.pdf. Retrieved on August 6, 2012. ↑ 7.0 7.1 7.2 7.3 "Guide to the Canadian House of Commons". Parliament of Canada. 2012. http://www.parl.gc.ca/About/Parliament/GuideToHoC/index-e.htm. Retrieved on August 6, 2013. ↑ "Northwest Territories Act". Department of Justice Canada. 1985. http://laws-lois.justice.gc.ca/eng/acts/N-27/index.html. Retrieved on 2013-03-25. ↑ "Yukon Act". Department of Justice Canada. 2002. http://laws.justice.gc.ca/eng/acts/Y-2.01/FullText.html. Retrieved on 2013-03-25. ↑ Department of Justice Canada (1993). "Nunavut Act". http://laws.justice.gc.ca/en/N-28.6/index.html. Retrieved on 2007-01-27. ↑ "OCOL - Statistics on Official Languages in Yukon". Office of the Commissioner of Official Languages. 2011. http://www.ocol-clo.gc.ca/html/yukon_e.php. Retrieved on August 6, 2013. ↑ "Nunavut's Official Languages". Language Commissioner of Nunavut. 2009. http://langcom.nu.ca/nunavuts-official-languages/. Retrieved on August 6, 2013.